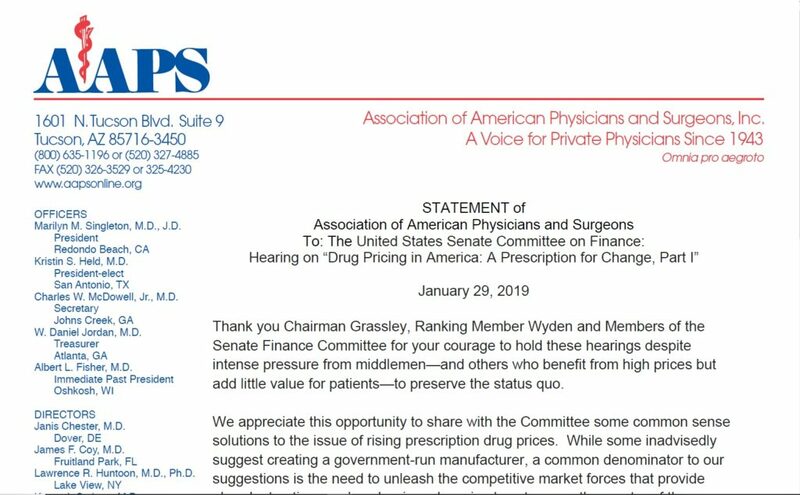 Thank you Chairman Grassley, Ranking Member Wyden and Members of the Senate Finance Committee for your courage to hold these hearings despite intense pressure from middlemen—and others who benefit from high prices but add little value for patients—to preserve the status quo. We appreciate this opportunity to share with the Committee some common sense solutions to the issue of rising prescription drug prices. While some inadvisedly suggest creating a government-run manufacturer, a common denominator to our suggestions is the need to unleash the competitive market forces that provide abundant options and push prices down in almost every other sector of the American economy. 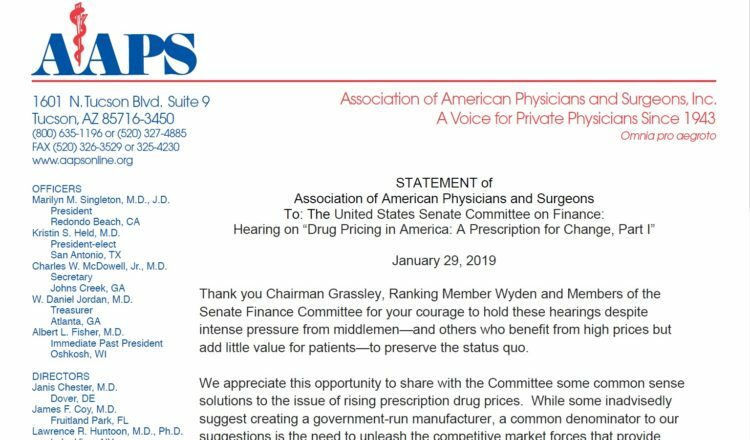 One especially responsible culprit for soaring prices is the safe harbor to Medicare anti-kickback law enjoyed by Group Purchasing Organizations (GPOs) that has been further extended by administrative guidance to Pharmacy Benefit Managers (PBMs). The Federal statute granting this “safe harbor” is 42 U.S.C. 1320a-7b(b)(3)(C), the language of which was established by the “Omnibus Budget Reconciliation Act of 1986,” strengthened by the “Medicare and Medicaid Patient and Program Protection Act of 1987,” and subsequently ensconced in federal regulation at 42 CFR 1001.952 (j). The provision ostensibly facilitates greater bargaining power for the purchasing of supplies and drugs. However, the safe harbor has in practice driven up costs and scarcity by perpetuating a system rife with hidden kickbacks, rebates, and single source contracts, that financially benefit GPOs, PBMs, and large manufacturers, but constrain competition and ultimately harm patients. It is time to repeal 42 U.S.C. 1320a-7b(b)(3)(C) and direct HHS to revoke any related regulations and guidance that protect such improper kickbacks. Physicians Against Drug Shortages calculates that such “corrupt practices have driven up the prices of drugs sold by PBMs to individual consumers by at least $100 billion annually.” This is in addition to the $100 billion per year in inflated supply costs that result from kickbacks to GPOs. For additional details see http://www.physiciansagainstdrugshortages.com/ and the enclosed article, “Group Purchasing Organizations: Gaming the System”, by AAPS President Marilyn Singleton, MD, JD published in the Journal of American Physicians and Surgeons, also available at http://www.jpands.org/vol23no2/singleton.pdf. Diabetes patients are one group particularly hard hit by the collusion between PBMs and manufacturers. CBS News recently reported that “the cost of two common types of insulin increased 300 percent in the past decade” thanks in large part to kickbacks to PBMs. For example, lower cost generic insulin drugs are excluded from plan formularies, when brand name manufacturers agree to pay larger “rebates” to PBMs. This Committee should request, subpoena if needed, and make public, contracts related to the sale of insulin to help shine sunlight on these secret backroom deals. In addition it should similarly obtain copies of contracts related to other medical products that have recently seen a dramatic rise in scarcity or price: e.g. Baxter’s contracts related to saline market allocation, the Hospira (now Pfizer) contracts for fentanyl, and Mylan’s contracts for Epipen. The FDA under the leadership of Scott Gottlieb, MD has made welcome progress in increasing the number of lower cost generic drugs available to American patients. 971 generics were approved by the agency in 2018, more than in any other year. More is needed. We urge the Committee to support the reintroduction and passage of the “Creating and Restoring Equal Access to Equivalent Samples Act of 2018” (CREATES Act). The legislation “would promote drug price competition by making it easier for medicines whose patents have expired to be sold as less expensive generic versions,” by requiring manufacturers to provide drug samples at a fair market price within a reasonable time,” explains Dean Clancy writing in The Hill. Addressing “patent thickets that are purely designed to deter the entry,” as Commissioner Gottlieb puts it, is another anti-competitive practice the Committee should investigate and address. Pharmacy Benefits Managers and brand name manufacturers are not alone in using improper practices to limit competition. Generic drug makers are also entering into anti-competitive agreements. “What started as an antitrust lawsuit brought by states over just two drugs in 2016 has exploded into an investigation of alleged price-fixing involving at least 16 [generic drug] companies and 300 drugs,” reports the Chicago Tribune. We encourage the Committee to take a look into such abusive practices and consider how it can support ongoing efforts by state attorneys general to end them. Meanwhile, independent physicians are providing tremendous savings to patients with in-office dispensing of prescriptions that cut out the cost increases caused by middlemen like PBMs. For example, a 72 year old female patient with multiple chronic conditions purchases all nine of her medications through a Direct Primary Care office for $14.63/month. Through her Medicare “coverage” her cost would be $294.25 per month. The Senate Committee on Finance had jurisdiction, during the 115th Congress, over S. 1358, the Direct Primary Care Enhancement Act, which would increase patient access to this promising delivery model by simply clarifying that Health Savings Accounts can be used for these arrangements. We urge the Committee to expedite consideration and approval of similar legislation during this 116th Congress. In conclusion, lowering costs for care is going to mean ending the improper flow of money to middlemen profiting without adding value to patient care. We encourage the Committee to take action to end failed policies that benefit the bottom lines of these special interests and simultaneously implement solutions that hand control back to patients. Please do not hesitate to reach out to us for further discussion about our concerns.